either as slaves or family members. At the interpretive centre, the Norse captain is joined by his Irish wife and Irish ships carpenter. 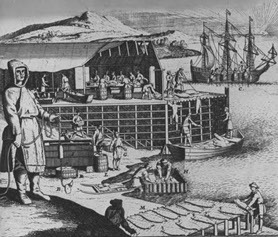 This early engraving depicting the cod fishing is almost identical to a similar illustration on the Waterford page. Which came first? Newfoundland is the only place outside Europe with its own distinctive name in the Irish language. It has been described as the most Irish place in the world outside of Ireland and the Irish have been settling in Newfoundland for almost 400 years. 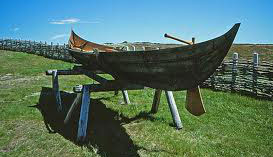 The first record of a Waterford ship on the Grand Banks in Newfoundland dates from 1534. And in 1608 Patrick Brannock, an Waterford seafarer sailed annually to Newfoundland from the French port of Bayonne. Furs were also an attraction and in 1662, an Irish trapper and his native companions were reported to be poaching beaver. By the 18th c, thousands were reported to be travelling from Ireland's south east to Newfoundland. The city of Waterford, the centre of the early Newfoundland cod trade, is twinned with St. John's Newfoundland. "In early March ships would arrive in Waterford, anchoring at PassageEast. The ship's captain employed an agent, to recruit young men of about 17 yrs. from the southeast to sign on for a seasons fishing in Newfoundland. The ship would take on supplies of board, butter, salt pork, peas, beans, porridge, bread and ships biscuits made by Jacobs a well-known Irish biscuit maker still in existance today. The ships left Waterford with the first favourable wind and the average crossing took 25 days. Bad weather meant some crossings took 40 days . 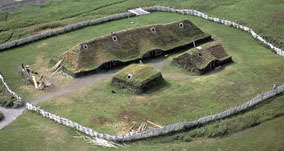 Arriving in Newfoundland they set up a camp of small timber shacks and spent the first month fishing for capelin which they used for bait in bitter cold and frozen seas. In May the first cod appeared on the Grand Banks to spawn. The fishermen rowed out to the fishing grounds in small boats. Two men to a boat. One man lowered the longline with hooks every few feet while the other baited it. Then the line was slowly hauling back up. A good day would end with a boat load of cod. The cod was then dried and salted ready to sell all over the world. The salting of pork to make bacon was invented in Waterford and bacon was a vital staple of the fishermen in Newfoundland. In October the fleet returned to Waterford often via Spain where they collected salt, olive oil and fruit. The return trip usually took only 14 days because the wind was behind them. It is estimated that the profits from the Newfoundland cod trade built half of Waterford quay, from the Clock Tower to the bridge and many of the large houses along the river were built for the fishing merchants . In fact the trade led to the establisment of ten bacon factories and five ropeworks in the city, barrel making and a sail-making factory in Cheekpoint." Other numerous Ireland Newfoundland connections will be added in the near future.